We have just moved across from Vanilla forums to bbPress. Our Users have been duplicated with imported_username & all the replies attached to that User have been attached to imported_username. However, when our Users login with their normal username they have not been assigned any replies. Yet old posts they have made, when they click on the display name it shows the imported_username details & replies. 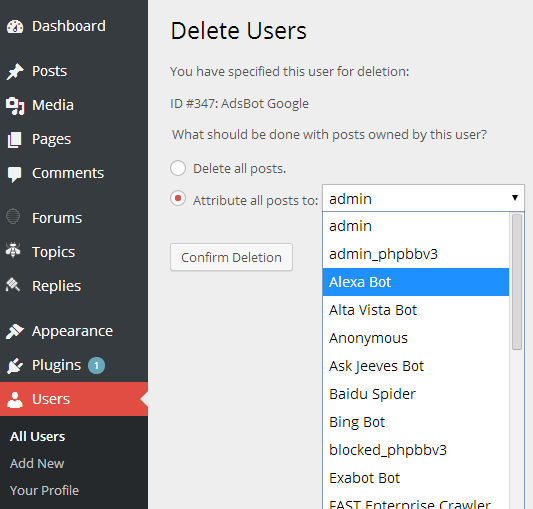 I presumed I would be able to delete the imported_username and choose to attribute all posts to the old username however for some reason I do not get this option. Did you import the users twice? Presumably you should see user1 & imported_user1 in wp-admin user panel? You should be able to delete imported_user1 and it will prompt you to attribute everything to user1 via a dropdown selector. This is not the case. When I click delete user. It just asks me to confirm deletion then it deletes the user without any option. What other plugins are you using that might be altering your users panel?